REVERIE Hair Care - It's not a dream — janny: organically. If you've seen me at all in the past few years, chances are, you've witnessed the janny-bun - aka my chronic top-knot situation because this mama just doesn't have time to "do" my hair. I'm a shower-squeeze-and-go kind of gal. But lately I've been letting my hair down more because I've been using products that clean well and tame and define my waves without blow drying. In my experience, shampoo is one of the toughest beauty items to replicate in a "clean" fashion. It has to truly clean; I mean, get my hair squeaky, without stripping. This is no easy task particularly when one uses styling product on their hair. But on top of that, I want a line that's honest about their ingredients. No greenwashing marketing tactics passing their entire product off as organic or implying that "plant-derived" somehow means it's not chemically processed. The Detox Market recently sent me over the line from GM Reverie to try out and I'm smitten. I originally heard about it from Bee of H is For Love, and if you know Bee, it's one of those If it's good enough for her, it's good enough for me situations. But of course, I still looked into the ingredients. After years and years of trying cleaner/greener hair products, I've found, for my hair, some of the shampoo ingredients still needs some chemical-intervention. And that's ok. If it works amazingly, I just want those chemicals to be minimal and created in the least-harmful way. 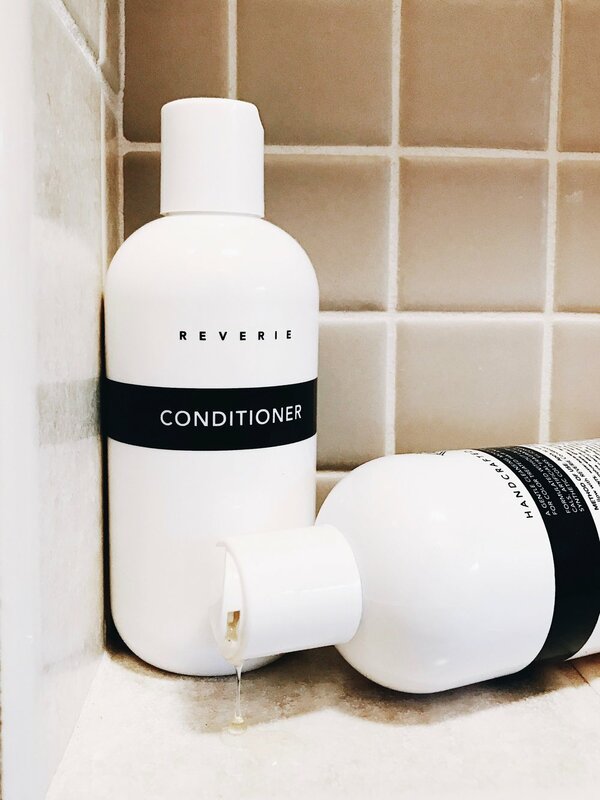 In fact, Reverie products do not contain ethoxylated ingredients, and instead use coconut and sugar based surfactants. The first thing I noticed was how small the bottle was! It's about 8.5 oz which seems small for the price point, but once I used it, I realized I was using about 1/3 the amount of REVERIE than my other shampoos. So it should last me just as long, if not longer than my other, larger, shampoos. It carries a citrus-y/sandlewood-y/light vanilla/jasmine scent and boy does it CLEAN well, even my scalp is rejoicing! It was at this point I was just hoping all the rest of the products performed just as well. I could tell the conditioner did a great job moisturizing, not only because of how it felt, but because of how wavy my hair was right out of the shower without having to scrunch it first. This one is scented with similar essential oils, though I found it to be less-citrus-y. At first, I thought this was simply for dry scalp, but then I read that it's actually a leave-in treatment featuring Apple Stem Cells and Sweet White Lupine plant protein that protects and promotes hair growth. I was nervous using it because I thought it was going to leave an oily residue, but it doesn't. I simply put a few drops on my fingers and massaged it into one area of my scalp while my hair was wet, then repeated the process over the rest of my scalp. I must say it was extremely relaxing. I'm looking forward to seeing how my hair changes over the next few months of use!This was definitely one of the more "crunchier" smelling formulations. There's a good line up of essential oils in the ingredients: Rose, Frankincense, Bourbon Vanilla, Sandalwood, Palmarosa, Balsam, Ylang Ylang, Patchouli. I should mention that I generally wash my hair at night...not every night, come on, I'm a mom, I'm lucky to squeeze in two hair-washing's a week. Usually I'll sleep with damp hair in a bun then apply RAKE in the morning when/if I take my hair down. This styling balm is not crunchy at all, in fact it further moisturizes the hair with a sweet smell and offers a light, defining hold. I don't know that I could pick a favorite product yet, I'm a little excited about all of them right now! Check them out here!